The Trigrad Gorge is a 7-kilometer defile north of the village Trigrad, beneath towering marble cliffs cut over millions of years by the Trigrad River. The gorge was declared a protected reserve by Decree № 4021 on December 6, 1963. In places the cliffs are some 300 meters apart, but in a considerable portion of the gorge, for some 2-3 km, they are only separated by about 100 meters. On the western side of the gorge the cliffs rise roughly 180 meters, while on the east they are 300-350 meters high.These gargantuan dimensions place the gorge third among all such geological formations in Bulgaria. The road to Trigrad winds along the river that in places pours from the rocks. It is a typical Bulgarian one-lane mountain road, with traffic in both directions. To drive this narrow, winding road requires considerable attention and tolerance, since cars traveling in opposite directions can’t pass each other. Because this narrow road is squeezed between the river on one side and the sheer cliffs on the other, travelers get the impression that Trigrad is much more distant than it is, and that the village is guarded by stone fortress walls closely guarding the mountain’s secrets. The massive cliffs that toward the upper part of the road seem to almost touch each other, that seem to steal the very sunlight, present visitors with a humbling sight, and the considerable natural beauty of the surrounding Rhodopes completes the unforgettable picture.The Trigrad River disappears into the earth at the entrance to The Devil’s Throat Cave, only to reappear some 530 meters below in a different cave. The Devil’s Throat Cave is a favorite tourist destination and one of the country’s most impressive developed caves, in part because of its huge waterfall fed by the river – a 42-meter drop. There are many other caves in the area, but most of them are relatively small (only 12 are more than 100 meters long). A particularly interesting cave for tourists is the Haramiyska Cave on the cliff face opposite The Devil’s Throat Cave. Remains from Neolithic cave dwellers have been discovered there However, the cave can only be visited with the use of climbing and spelunking equipment and accompanied by an experienced guide. Not far from these caves is the beautiful Yagodina Cave. 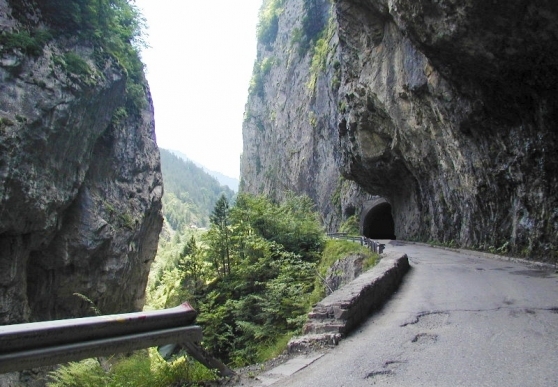 The road through the Trigrad Gorge leads to the picturesque village of Trigrad, where tourists will find a warm welcome. The village offers overnight accommodations and can arrange other tourist activities. Near the village there are a number of hiking trails that allow visitors to further appreciate the beauty of the region. Devil’s Throat Cave /Dyavolsko Garlo Cave/ is located in the Western Rhodopes, 17 km from the city of Devin. It is among those caves that do not offer dazzlingly exquisite rock formations. What entrances visitors is the possibility of embarking on a real journey of discovery, partaking of a mysterious and awe-inspiring underground kingdom. The cave’s entrance resembles a devil’s head, and down its throat rushes a massive waterfall that from ancient times has captivated imaginations and given birth to numerous legends. It is an arresting fact that nothing carried into The Devil’s Mouth Cave by the river emerges from it. Many attempts have been made to track pieces of wood and other material through the cave, but they all vanish without a trace on the underground river, arousing curiosity and tantalizing the imagination. Experiments performed with dyes have shown that it takes more than 1½ hours for the water to traverse the short distance from one opening to the next, fueling speculations about an extensive system of underground streams in the cave. The tourist itinerary begins in an artificial gallery that leads visitors along the waterfall into the “Hall of Thunder.” There are 301 breathtaking steps descending alongside the roaring falls. The view of the roiling water, its muffled roar, and the enormous expanse of the cavern below is undeniably sublime. Handrails protect the entire route. There are three carvings in the walls of the caves that are particularly noteworthy. The first is a likeness of a devil’s head located near the entrance to the cave, just before entering the Hall of Thunder. The second is the full figure of a man done in a Classical style, carved into the rock face of the Hall of Thunder. Approaching the exit, a small fountain is visible with a recessed altar that supports the figure of The Virgin. The best time to visit is in late spring and summer, when the entrance to the cave is surrounded by invigorating greenery and the Rhodopes are most inviting. The local spelunkers’ club organizes descents into the caves in boats from the beginning of May to the end of October. The club provides the necessary equipment – boats, life jackets, and life preservers. These descents are arranged for three people and an instructor. Entrance to the caves is only allowed with a tour guide.